Okay let's put this to bed, which method is the same technique used by MGM Studios? When crafting high quality ruby slippers (this means sewing the sequins and not gluing the sequins), hand-sewn replica ruby slipper makers over the years have used one of two methods to craft their ruby slippers. They either "sew sequins directly onto the shoe covered with a built-in fabric overlay" or "sew onto a flat fabric overlay pinned in a large round embroidery hoop and then remove and attach this overlay onto the shoe at the end." Although we appreciate everyone's work and we take nothing away from the hard work and dedication by ruby slipper artists who decide to use the method of their choice, we just wanted to inform people that the first method "sew sequins directly onto the shoe covered with a fabric overlay" is the true method that MGM used to craft the original ruby slippers and we will explain this in more details below. Ruby slippers that are made by sewing onto a flat fabric overlay and then attaching the overlay to the shoe at the end have a problem because they can't be worn and only intended for display only, it's as simple as that. No ruby slipper artist using this method can honestly say that their ruby slippers are wearable, so they're not crafting their ruby slippers correctly in terms of the authentic method employed by MGM Studios. MGM's method of sewing individual sequins directly onto the shoe can be worn, this is because the sequins are firm and tightly attached onto the shoe, therefore the sequins won't come off. By sewing the sequins onto a fabric overlay and then attaching it onto the shoe afterwards, all the sequins goes out of position after the overlay is removed from the embroidery hoop, and the sequins become loose on the shoe and this rules out any thought of wearing them because they could easily come off. Not to mention both overlays always does not fit perfectly on the shoes so you have uneven sequins along the bottom of the shoes passing the soles that could easily be stepped on when walking in the shoes. 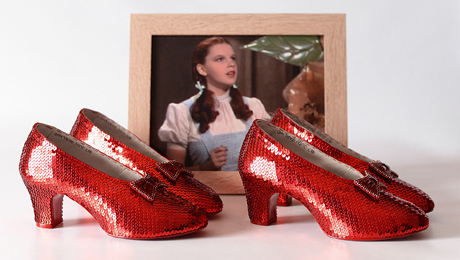 We must remember that the original ruby slippers were made for Judy Garland as Dorothy to jump in, run in, skip in, and not just on the flat surface of the Yellow Brick Road or the Emerald City floor, but also on grass, dirt and artificial snow, so the ruby slippers were designed to be worn and withstand all sorts of tough conditions. So if a pair of hand-sewn ruby slippers can't be worn then that is a dead set giveaway that they weren't created the same way as the original ruby slippers. 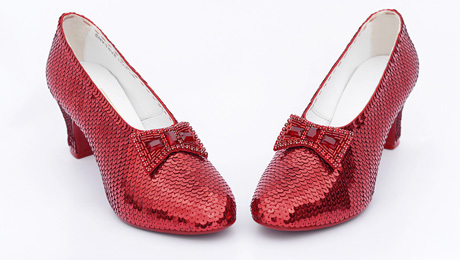 Experts agree with us that only a handful of ruby slippers were made. 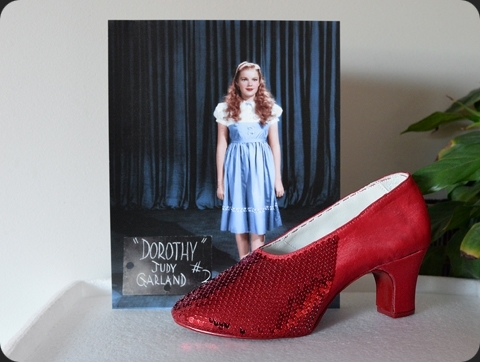 This is because the original ruby slippers were difficult to craft and very time-consuming when sewing the sequins directly onto the shoes, so the number of ruby slippers they had available to use for the movie was very limited. Some artists who sew onto a flat fabric overlay and then attach this overlay onto the shoe at the end claim they could make 50-100 pairs of ruby slippers in a year, or it only takes a few hours to finish sewing on the overlay. They can do it because they are not using the correct technique to make their ruby slippers. 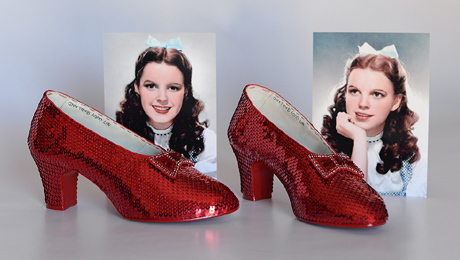 If it was this easy to make the original ruby slippers, MGM Studios which employed the best costume makers in America would have over 50 pairs available on hand, and they wouldn't need to reserve any ruby slippers for the important scenes. The studio, as rich as they were, would just make new pairs whenever they needed them if was as quick and easy to complete a pair in a matter of hours. 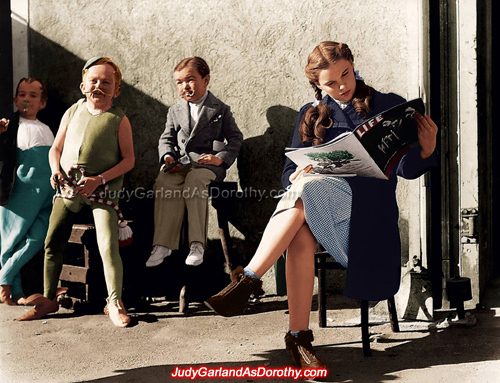 It's also known among Oz historians that the original ruby slippers needed to be shared among three girls involved in the movie. 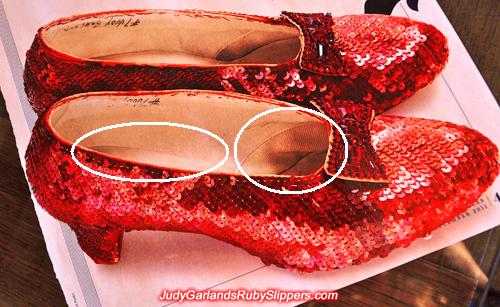 This is because MGM only had the ability to make a limited amount of pairs, and more proof that the original ruby slippers were made carefully, slowly and painstakingly by sewing directly onto the shoes, and not made quickly by sewing onto a flat fabric overlay. 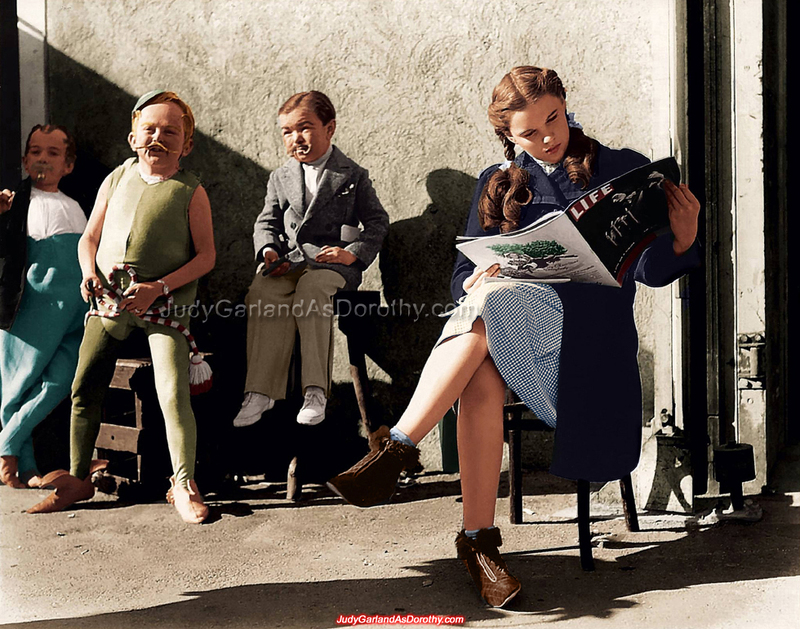 Judy Garland as Dorothy, pictured below, was prevented from wearing the ruby slippers and given other footwear when she wasn't filming, in order to keep the ruby slippers in great condition because MGM only had a limited amount of pairs for use in their production. 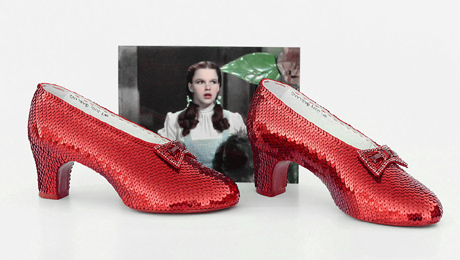 The lack of stitching within the bottom interior of the original ruby slippers on the vamp and bottom of the lining is strong evidence that the fabric was built-in as part of making the base shoes for the original ruby slippers. The only hand stitching required was along the top lining of the shoes to attach the fabric. The leather sole at the bottom of the shoe and side of the heel covers the other end of the fabric. This is also the same way we craft our base shoes with built-in fabric, we make our own shoes from scratch so we know the methods of shoe making. If the fabric overlay was hand sewn onto the shoe after sequining is finished on an embroidery hoop like some artists like to do then you will have visible stitches inside the shoe. This is not how the interior of the original ruby slippers look. If glue was used instead of thread to attach the fabric overlay then that is incorrect too since the original ruby slippers is a genuine hand-sewn product no part of the fabric overlay is glued. This is how the correct interior of the original ruby slippers crafted by MGM Studios looks. The lack of stitching in the circled area proves that fabric was built-in with the shoes. 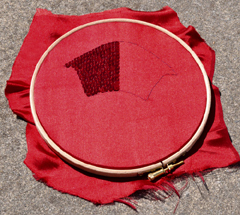 This is an example how an incorrect interior may look if an artist attaches the fabric overlay to their shoes after they finish sequining (the red lines represents visible threads). 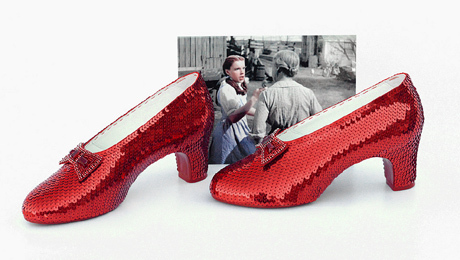 The sequins were sewn directly onto the shoe covered with a fabric overlay is the technique used by MGM Studios to make the original ruby slippers. We have more evidence if we delve into more technical details, which we will explain later. 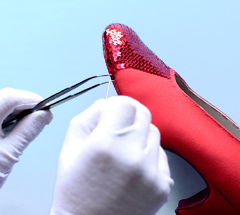 Not only do we know how to sew sequins, but we are expert shoemakers who understands the ins and outs of making shoes and the correct sequining process behind the original ruby slippers, than those who purchase their shoes to make their ruby slippers. Again, all hand-sewn ruby slippers are beautiful regardless of the methods used to make them, and we consider some artists our friends who we've helped each other, in one way or another, over the years and we respect their work, but if you've ever wondered how MGM Studios made the original ruby slippers then we hope this bit of information helps. Do you have any information to add to this page? We would love to hear your thoughts in a constructive manner.